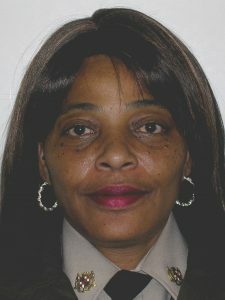 Security Officer Gwenda McGowan celebrated 18 years of service with the Maryland Capitol Police on January 18; she was hired in 2000 as a temporary building guard trainee. In her determination to expand her knowledge and improve her skills, Officer McGowan has earned three different certificates from the Federal Emergency Management Agency (FEMA) from courses she participated in that are designed to train personnel on how to operate safely and efficiently during an emergency incident or event. During the last months of 2017, Security Officer McGowan worked 200+ hours of overtime, including some 16-hour shifts, to help the Maryland Capital Police cover unexpected vacancies and events. If you work in Annapolis, you probably saw her last September and October securing the damaged Senate parking garage doors to ensure that security at this building would not be breached. While waiting for the parts for the garage to be delivered and repaired, she also ensured that the employees who park in this garage were not inconvenienced. Employees voted Security Officer McGowan Employee of the Month from the December 2017 Caught DGS nominees.